Bob Levey/GettyTed Cruz. his wife Heidi, and their daughters Caroline (center front, in pink) and Catherine (right, in pink) are pictured at a campaign event in 2016. 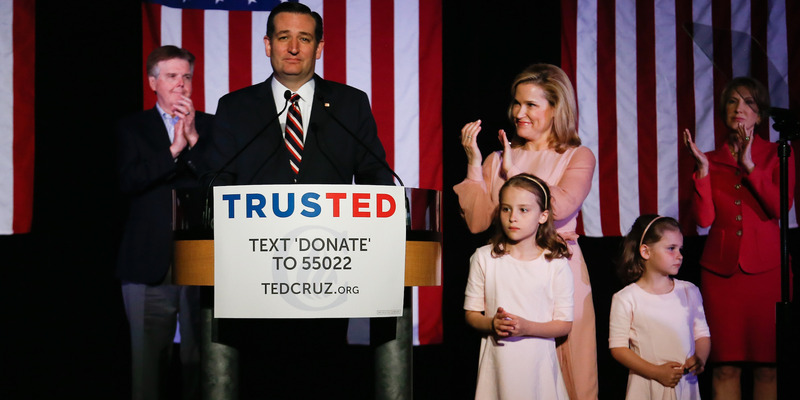 Heidi Cruz says her eldest daughter, Caroline, was not supportive of her decision to take a leave of absence from her job at Goldman Sachs in 2015 to campaign for her husband, Ted. She says in a new profile in The Atlantic that Caroline, who was seven when the campaign started, asked if the job of first lady was paid. Ted Cruz’s eldest daughter was apparently none-too-pleased that her mother took unpaid leave to help him campaign in the 2016 Republican presidential primary. 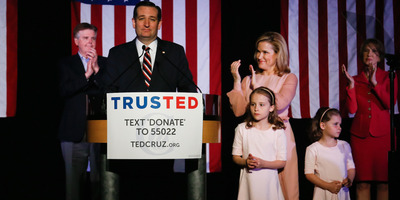 In a profile of Heidi Cruz in The Atlantic published Thursday, the wife of the Texas senator said her daughter Caroline, who was seven when the campaign started, was confused as to why she would leave her job as a managing director at Goldman Sachs to hit the campaign trail. 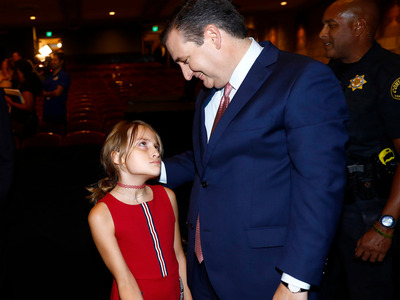 GettyTed Cruz shares a moment with his daughter Caroline after his debate against Beto O’Rourke on September 21. During the primary, Caroline made some headlines of her own, when television cameras caught her recoiling from her dad’s kiss, and later teasing him during a CNN town hall about the fact that her school had footage of him in a pink feather boa for a daddy-daughter picnic. While Cruz won the first primary, in Iowa, he started to drag behind then-Republican candidate Donald Trump, and eventually suspended his campaign in May. He’s currently running for reelection in Texas against Rep. Beto O’Rourke. As of Thursday, Cruz leads O’Rourke by an average of seven points, according to Real Clear Politics.